Last week, we told you all about Assassin's Creed Unity, one of the two games in Ubisoft's action-adventure series that will be out this fall. Today we've got some new details on the second game: Assassin's Creed Comet. GameBlog's report claims that Comet will take place in and around 1758; that it will star a sailor named Shay who betrays the captain of his ship; and that it's set on the Atlantic Ocean. Comet, GameBlog says, will continue the nautical theme established in last year's Assassin's Creed IV: Black Flag. We haven't been able to confirm all of those plot details, and some of it appears to be speculation by GameBlog. But people familiar with Comet tell us that this fall's last-gen Assassin's Creed will indeed be set in North America and star a protagonist named Shay, who is a member of the Templars, the assassin-hating order that has traditionally served as primary antagonist in the Assassin's Creed games. We also hear that Comet will let you go to New York and do a great deal of sailing along the coast of the Atlantic Ocean. One source describes the game as a cross between Assassin's Creed III and the Freedom Cry DLC for Assassin's Creed IV. 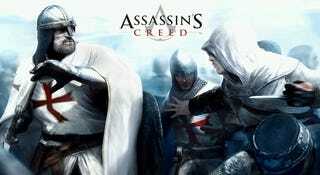 Sources also say that Haytham Kenway and Adewalé will make appearances, among other returning AC characters. News of two Assassin's Creed games this fall gives new fodder to critics who have already accused publisher Ubisoft of milking the annual series. While last year's Assassin's Creed IV: Black Flag got a cross-gen release, hitting both last- and current-gen consoles, this fall's split release means fans who want to play both games may need to own two different machines, as neither the Xbox One nor PS4 is backwards-compatible. The decision also frees up the developers of Unity to make a game that isn't limited by stale hardware. All that said, Ubisoft's ability to juggle development teams in order to give them two or three years to make games that come out on staggered annual releases has resulted in long, detailed, feature-rich games, some of them criticized but others, including Black Flag, beloved by critics and players. It's worth noting: there's an image floating around some gaming websites that claims Comet will be on "next-gen" platforms. This image, according to people I've talked to, is fake. It's full of errors, and from what we hear, Comet is currently not planned for PS4 or Xbox One. Ubisoft declined to comment for this story.